There are many excellent museums in the beautiful Ocean City area in Maryland that are worth visiting, but none quite as unique as Ripley’s Believe It or Not. This famous venue is found in several places across the world including New York, London and Toronto. There are many branches located in the United States, and Maryland has two with one based in Baltimore and the other in Ocean City. Travellers staying in the US state should definitely visit both if they have the time, as they are very memorable destinations ideal for families. The popular Baltimore museum opened in 2012 and is based in the Light Street Pavilion of Harborplace on Inner Harbor. It attracts a huge number of travellers every year and is a superb place to spend a morning or afternoon with the family. There are more than 500 oddities spread over seven galleries in this destination. Tourists will adore the mirror maze and 4D theatre that has moving chairs and excellent special effects. Some of the displays include a miniature model of Hogwarts Castle from the Harry Potter books, which is made from thousands of matchsticks and a rare African masks as well as a T-Rex footprint. The Ocean City venue is based on the famous boardwalk at Wicomico Street and it is an extremely popular spot for families. It is found at the entrance of the Jolly Roger’s Pier Amusement Park, which offers thrilling rides, rollercoasters and a huge Ferris wheel. The Ripley’s museum is known for a large model of a shark appearing as if it is crashing through the venue. This destination similarly to its Baltimore branch has hundreds of exhibits over 12 galleries, including the world’s rarest egg and a section of the Berlin wall. There is also a mirror maze and the chance to see some very unique artwork. Travellers heading to this attraction will definitely want to find top Ocean City package deals for their vacation. 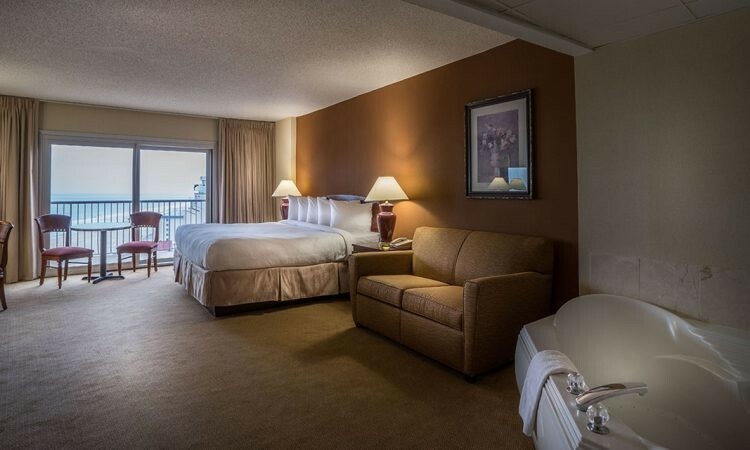 The Grand Hotel Ocean City is a lovely place to pick that offers amazing rooms with bay views that have a range of excellent amenities including a television, mini-fridge, coffee maker and microwave. These air-conditioned living spaces are ideal for families, couples and individuals whether there for business or pleasure. The modern rooms contain free wireless internet and the hotel also has the brilliant Aqua Day Spa and fitness centre. There are five venues to eat at that offer meals such as American-style breakfasts to freshly baked pizza. Tourists will also appreciate the indoor and outdoor pools in the blazing sunshine. Travellers heading to Ocean City have come to the right place for a holiday if they are with their family, as there are so many fun activities on offer for young ones. Visitors can just have a rest on the beach with their fellow tourists in the sunshine or take a refreshing dip in the water. The vibrant boardwalk provides a long list of things to do including head to the shops, and eat out at the many top seafood restaurants. Tourists can also attempt some exciting water sport activities such as jet-skiing, sailing, surfing and paddle-boarding.